This week's episode follows the DiMeo family's trip to the grocery store. 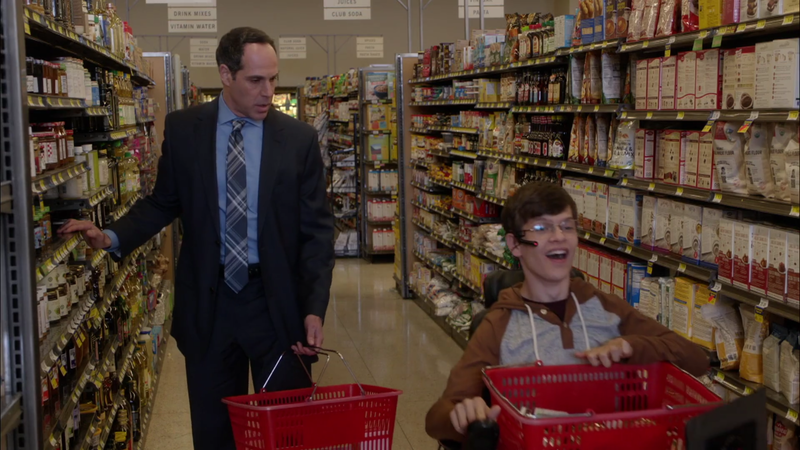 At the beginning of the episode, the family arrives at the grocery store, and when all of the handicap spots are full, Maya parks in the one other close spot, which is tight. It's funny when Maya insists that this will work, and has Dylan climb out through the top of the van. In getting out, Maya dings the car next to her, though she insists that the ding was already there. Maya later ends up discovering that Ray left a note, and when she goes out to the parking lot, she ends up getting along very well with the woman. It is hilarious when they team up, and then when Ray doesn't defend Maya. Ray ends up destroying a bunch of things, and that moment is a bit over-the-top. In the end, Maya says that it's always guilty until proven innocent with her, and she wants Ray to treat her like a stranger, which was a funny line. Jimmy and Dylan discover that the store had a special shipment of a soda, but the shelves are empty. Jimmy promises Dylan that he will get her the soda, and it's pretty funny as she recalls all of the times that he has promised her things and he hasn't followed through. They go into the backroom to look for the employees' stash, which is very entertaining, as it plays out like an action movie. Meanwhile, Kenneth, who, it turns out, works at the store, watches the DiMeos, and these scenes are also movie-esque. In the end, the big reveal comes to the DiMeos, as Kenneth reveals that he is the weekend manager. People are annoying to J.J. by commenting "you have a license for that thing?" But one person is much worse when he is rude, and moves J.J. out of the way to get something. However, he drops his list, and J.J. decides to use that to his advantage, blocking the man on each aisle he tries to go to. This is pretty funny, but nothing wonderful. Jimmy, Dylan, and Kenneth were hilarious this week, and I really enjoyed Maya and Ray's story for the most part. What did you think of "D-I-DING"? Leave your thoughts in the comments!